his remarkable exhibition will display sketches, studies and photographs of a number of Evelyn De Morgan’s paintings lost in a 1991 art store fire. 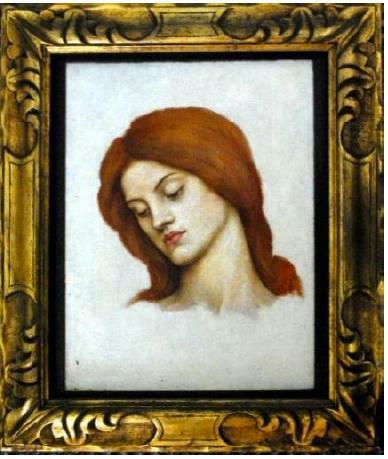 The Lost Paintings of Evelyn De Morgan will run from 1st February to 20th April 2013. In October 1991 a fire ravaged the Bourlet’s art storage unit where much of the De Morgan Foundation’s art collection was stored. In one night more than 15 paintings by Evelyn De Morgan and many other artworks were tragically destroyed – lost for future generations to admire. This exhibition will display drawings and studies for these lost paintings, alongside colour photographs taken during the preceding years in the art store, giving an unprecedented opportunity to discover more about these extraordinary works of art. Evelyn De Morgan is renowned for her oil paintings which are abundant with Pre-Raphaelite imagery, spiritualist symbolism and strong feminist undertones, but she also exhibited remarkable skills in drawing. The De Morgan Centre’s collections contain a significant number of Evelyn’s drawings and pastel studies for her paintings, which give a fascinating insight into her creative process. This exhibition focuses on a small group of rarely seen studies by Evelyn De Morgan which demonstrate her working process – from loose compositional sketches, to detailed anatomical studies (often of both clothed and naked forms in the same pose) and refined and accurate pastel studies for the final work. Evelyn drew from life using a small pool of models including her maid Jane Hales, family members and professional models. Recurring faces are familiar presences in Evelyn’s work, as demonstrated by two studies of male heads for St Christina Giving her Father’s Jewels to the Poor and The Marriage of St. Francis and the Holy Poverty, which are of the same Italian model.